Sharing Mobilities. New Perspectives For Societies On The Move? This call as a pdf file. 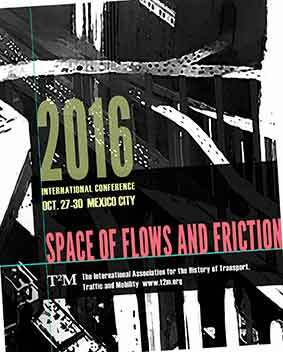 This year, the International Association for the History of Transport, Traffic and Mobility (T²M) invites scholars and PhD students to participate in a three-day conference to be held in the beautiful Quinta Colorada, within Chapultepec Park, in Mexico City, October 27th-30th, 2016. This is the first time that the association will have its Annual Conference in Latin America, after having met in Asia (India), Europe, and North America. We are excited to meet new colleagues from Latin America and learn more about transport history and mobility studies in this locale. The overarching topic “Mobilities: Spaces of Flows and Friction” aims to highlight the relationships between mobility and space, its temporality and production. These multiple relationships have been expressed in ideas such as territorialisation and de-territorialisation, movement-space, space-time and claims that state space is an effect of motion. Mobility studies and mobility history help us to think about space as dynamic, relational, open, in-process, networked, and therefore, as made of and making possible motion. At the same time, space can help us to think of the ways in which mobility is not just an abstract movement but takes (and makes) “place”, that is to say it has physical geographies, historical rhythms, and occupies concrete socio-technological constellations that include durable infrastructures, vehicles, corridors, gates, or barriers. Beyond its materiality, spaces of mobility may take shape as social, cultural and embodied relationships. Moreover, space can be seen not only as made up of flows but also of congestion, as moments of friction or stillness from national borders to bus stops. Flows and frictions not only show us the importance of mobility in the production of space but also how mobility is “spatialized.” Focusing on how those spaces were and are materially, socially and symbolically constructed, helps us to see how mobility is uneven – shaping and shaped by power relations, hence always political. Frictions’ histories remind us that mobility has not always been smooth and spaces of mobility tend and have always tended to (re)produce geometries of power since flows are conducted, regulated, controlled and governed. Frictions make spaces of mobility more visible and transparent, helping us to understand conditions such as design, social and material configurations, potentials for rearrangement, and user adoption or rejection. We hope to trigger new debates on space, time, and mobility, especially considering that our city venue itself will be a challenging, multilayered, massive and over-congested network of flows. Mexico City with its 24+ million inhabitants, besides being one of the largest cities in the world, is also one of the busiest transportation hives of the planet. Its “mega-mobility” connects to urban and transport policy mobilities across Latin America, and beyond, as permanent urban growth generates huge investments and new infrastructure. What kind of spaces are we producing through time? Can a new perspective, wherein mobility is central to understanding space, help us to re-write the ways in which those spaces were produced and re-think how they are lived? Urbanism now extends beyond cities to include “operational landscapes” of agricultural hinterlands, mining and extraction enclaves, and even ex-urban touristic natural parks and preserved wilderness. Urban metabolism includes the circulation of energy, water, foods, and other “eco-system services” that may connect (or not) to the regional, national or global networks. Finally, at an international scale, the vicinity of Mexico with the USA naturally triggers questions about borders as spaces of flows and friction, the interaction of the continent with remote places through legal and illegal trade and traffic. * Flows of (de)centralization: current debates between core and periphery. Papers may address the conference theme, or other social, cultural, economic, technological, ecological and political perspectives on the history, present, and future of transport, traffic and mobility. This mobility history conference openly aims to bridge research approaches, welcoming proposals from different disciplines dealing with mobility studies (history, sociology, anthropology, geography, economy, planning studies, business history, architecture, design, communication, etc.) We particularly encourage the submission of interdisciplinary panels. Debbie Douglas (MIT Museum Curator). Paper: The submission of an individual paper includes a 500 word abstract and a brief biography (100 words) along with contact information. Individual presentations at the Conference are limited to a fifteen-minute summary to allow for debate and discussion within the session. The full paper (usually 5,000 words) has to be submitted to an online repository prior to the conference. Panel: A panel consists of a chair and normally up to four paper presenters; or alternatively three papers and one discussant We especially encourage transnational, comparative and interdisciplinary approaches, and welcome proposals exploring theoretical or methodological issues as well as those of a more empirical nature. We invite recent entrants to the profession and graduate students to submit proposals. A panel submission should include an abstract of one-page, and 500 word abstracts for each presentation (provided separately by each author). A short biography of each presenter is also required, with contact information. Other: Research posters, art displays, or any other innovative way of presenting research outcomes are welcome. In this case, the submitter(s) are invited to contact the local committee via email. Submit your abstract here (you will need to create an account first). The deadline for submissions will be the 18th of March 2016. Please visit the conference website for submission, registration and news. Presenters will be notified of acceptance by the end of April, and conference registration and payment will be required before the end of July to appear in the program. All conference registration and travel information, including special discounted rates for hotel booking and additional tours available (to visit the spectacular pyramid complex at Teotihuacan; or to travel by boat on the Aztec canals of Xochimilco and visit the Museo Olmedo; or take the guided Sunday Bicycle ride) will be made available through the online system. Once an abstract or panel has been accepted, there will be a strict deadline for conference registration and full payment at least three months prior to the conference in order to appear on the program. Each year, T²M awards a limited number of travel grants to PhD students and scholars from developing countries toward travel expenses. This year we encourage in particular young scholars from South and Central America to apply. A travel grant form will be available for download on the conference website. The application deadline is May 15, 2016. Please send your application together with the abstract of your accepted paper to secretary@t2m.org. T²M has also a long tradition of “best-paper” awards.